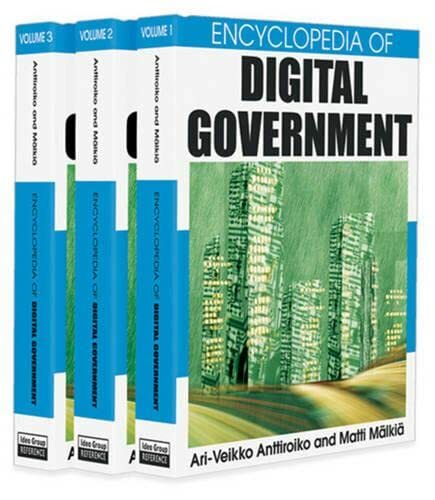 [PDF] Encyclopedia of Digital Government (3 Volumes set) | Free eBooks Download - EBOOKEE! Description: The information technology revolution that has swept across the world has changed the way the governments work and interact with their stakeholders. This explains why digital government or electronic government (e-government) has become one of the most important topics in the public sector reform agenda. Such an e-transformation in government and public governance has its roots in the 1950s when some few professionals and academics started to speak about the computerization of public organizations. For several decades the discussion was meek, concerning mainly the use of computers in internal operations of public administrations, such as accounting and recordkeeping. Wider perspectives started to gain ground as late as 1980s in the wake of the introduction of personal computers and the merge of computers and telecommunications. Yet, the most fundamental recent turn in the information technology revolution was the Great Internet Explosion of 1993-1994 and the increased popularity of World Wide Web (WWW) in particular. Since then the transformative power of e-government has been generally recognized. The Encyclopedia of Digital Government discusses topics that are at the core of this ongoing transformation. No comments for "[PDF] Encyclopedia of Digital Government (3 Volumes set)".